Climate change negotiations—cold after the freeze at Copenhagen—have warmed up again.In early April, negotiators met in Bonn, Germany, on the possible agreement that could be signed at the meet scheduled in December 2010 in Mexico. This was followed by a US-convened meet of the Major Economies Forum, better named the major emitters forum, in Washington. Next weekend, the group calling itself basic—China, Brazil, South Africa and India—is meeting in Cape Town to come up with its common position on negotiations. Then early May, German chancellor Angela Merkel has called some 45 environment ministers to come together in the castle of St Petersburg outside Bonn for another talk. All this will culminate, for now, in the meeting of the subsidiary bodies to the climate convention in early June, also in Bonn. So, the heat is on, the US fanning the latest climate bonfire. It is demanding the now infamous Copenhagen Accord, hammered out in the wee nights of the meeting, should become the only game in town. They want the world to stop discussing the Kyoto Protocol as well as the long term Cooperative Agreement—the two tracks that bring past polluters into a legal regime and future players into a cooperative arrangement to avoid emissions growth. To stitch this deal, they have put together their very own coalition-of-the-willing, which includes a powerful section of Indian policy makers. They want no full stops to this deal. The problem is this ‘deal’ is bad for climate change. It is bad for us. Here’s why. One, the Copenhagen Accord is weak in its commitment to reduce emissions. It does not set hard targets for rich countries (Annex 1). Instead, it promotes a framework for future agreements based on ‘pledge and review’. Industrialized countries will be allowed to voluntarily pledge their domestic targets, which will be aggregated at the global level. The target will be self-chosen and voluntary. The US has offered some 3 per cent reduction below 1990 levels, against the 40 per cent required of it. The Accord will simply legitimize its right to pollute, by saying it will do what it can domestically, with a ‘review’ to see if its ‘pledge’ is met. This is unacceptable because we know the sum of the current ‘pledges’—whatever that means—shows the world is no way close to its stated goal of capping global temperature rise at 2°C; by recent accounts, it is actually close to at least 3°C or more. Also, nobody is really asking the US to cut emissions according to its emissions in the atmosphere. In fact, discussions on tough emissions reduction by rich countries are completely off the agenda. Occasional noises are made to keep the Kyoto Protocol alive. But this is just form. The true function is to make the Copenhagen Accord supreme. There is no way the Copenhagen Accord can be billed as a climate change agreement. 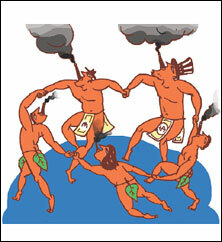 It is simply an agreement to legitimize the right to pollute. Two, the Accord will overwrite the principles of historical responsibility and equity in burden-sharing. As the world will no longer set targets based on historical and current emissions, the issue of equity in burden-sharing will simply be erased. The word ‘equity’ appears twice in the Accord, but as a smart ploy to fool some people. The fact is once the Accord’s framework is accepted, in the words of the US’ top negotiator, the “breach in the firewall between developed and developing countries” will be sealed. There will no longer be a distinction between countries that created the problem and so must take the first step to cut emissions—create ecological space—and countries that still need that space to grow. All of us will be equal in the world of polluters. Three, since mitigation targets will no longer be on the basis of responsibility or contribution to the problem, all countries will become equal sinners, too. They will take on what emissions reduction targets they can. Since developing countries such as India are now growing in terms of emissions, the heat will be on them. The burden of a costly transition will shift to the developing world. Under the current agreement, industrialized countries are expected to cut drastically and provide money to assist developing countries avoid emissions growth. But the coalition would like this formula to be history. Buried forever. The terms of the Copenhagen Accord are delicious because they are so simple. All countries do what they can to cut emissions. There is no international legal agreement, only a simple ‘pledge’ that is recorded, that is not called a ‘commitment’, so nobody can ever wave a red flag. What big brother will do is send inspectors, or ask for records, to check your compliance. This will be cleverly couched in the terminology of ‘international consultation’, so that we still believe we are not being asked to take on commitments. With this done, India’s environment minister will be able to say in Parliament: “All is well”. Now, what does this changed framework do to India’s efforts to cut emissions? Can India take on the cost of transition? I will return to the question, and more, next fortnight. But I can say today: All is not well.